The regional divisions of the China and Far East super-regions. The Eastern Asian regions are the combined regions of China super-region and Far East super-region. The area houses two unique mechanics acting in a similar fashion to the HRE in central Europe. In 1444 Ming holds the title of Celestial Empire and governs over the all the Chinese regions. In time other claimants to the throne may rise, be it the newly formed Qing from the north or one of the surroundings nations who may move to seize power when Ming is struggling to subdue large uprisings of Separatist rebels. Further to east lie the Japanese lands. Across the connected islands the Daimyos will fight for dominance over each other to claim the seat of the Shogunate. Whoever succeeds in this mission may not only dictate the rules of the land, but ultimately move forward and form the unified nation of Japan. Autocracy and Daimyo are the dominant government types in these parts (notable mentions are the Celestial Empire and Shogunate). Confucian is the prevalent religion in the mainland regions. Shinto is spread in the eastern part. Animist and Theravada can be found in the southwest. Chinese is the most dominant culture group in this region. Japanese and Korean can be found in the east. South-East Asian and Tibetan in the southwest. Some of these nations don't exist at the 1444 campaign start. They can appear if another nation chooses to form them. In (parentheses) are the historical start-dates they can be first played in, if applicable. For Daimyo, Independent Daimyo and the Shogunate. 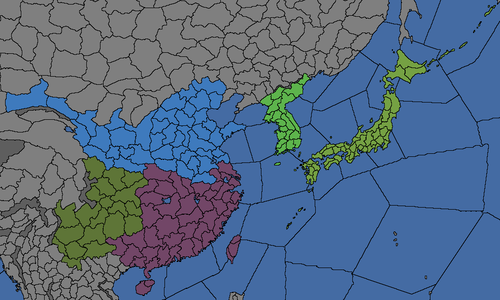 Notes: This region holds provinces necessary for forming Japan. All Daimyo nations are subjects of the shogun (owner of Kyoto) unless they currently fight to become the shogun or the decision Unite Japan is taken (government type is changed to Feudal Monarchy). For countries in the Chinese culture group, as well as Changsheng. Notes: This region holds provinces necessary for forming Mongol Empire, Qing and Yuan. The province of Luoyang (1836) is of religious importance for Mahayana nations. Notes: This region holds provinces necessary for forming Mongol Empire and Yuan. This page was last edited on 12 December 2018, at 14:14.